Business Hotel in a 5-minute walk from Asahikawa Station. All western rooms with SIMMONS bed and 40 inch TV. The greatest hotel! I've ever stayed in Japn. 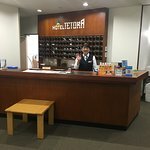 Get quick answers from Hotel Tetora Asahikawa Ekimae staff and past guests.